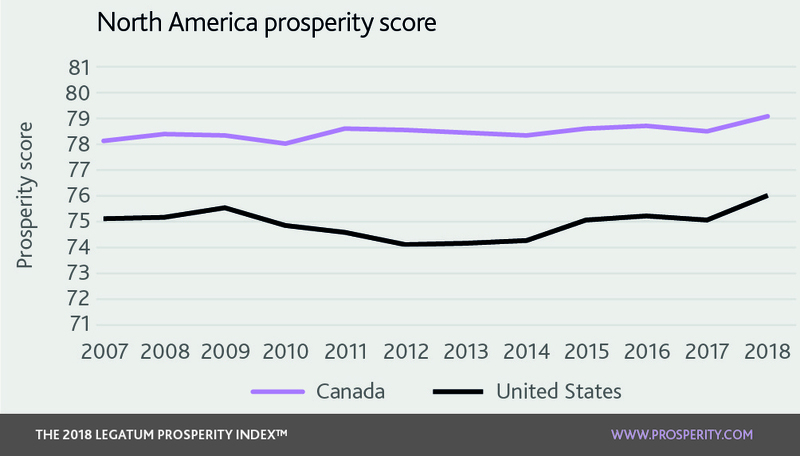 This year is the largest overall prosperity gain North America has seen since 2007; the region has improved after a small fall last year, making it the number one region. 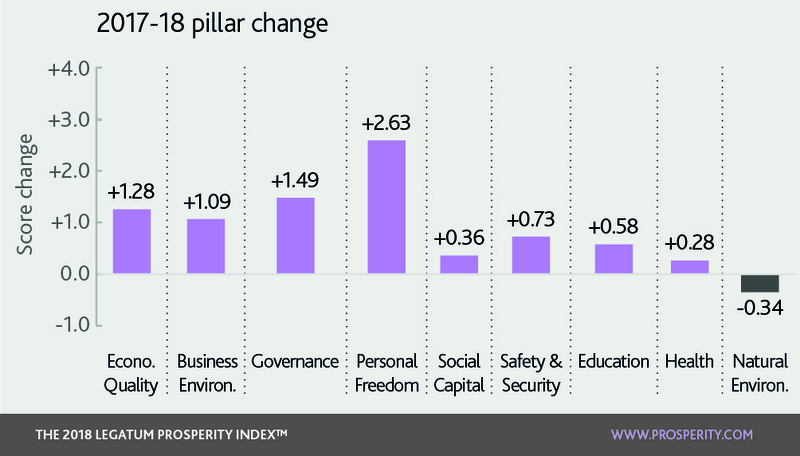 Canada improved in all pillars except Social Capital. The US improved across all pillars excluding Natural Environment. The regional gain of North America was heavily driven by four pillars: Personal Freedom, Governance, Economic Quality, and Business Environment. The region remains top of the rankings for Economic Quality, Business Environment, Social Capital and Education. Governance scores regained lost ground this year. The regional score is slightly better than last year, and Canada and the US sit at 8th and 19th respectively. After a decline last year, judicial independence scores improved in the US, and in Canada more citizens had confidence in the honesty of elections. After a substantial dip in Personal Freedom scores during 2017, the region has exceeded 2016 levels this year, with the largest increase resulting from the number of people reporting satisfaction with freedom, which is 87%. Canada overtook New Zealand to take the top spot for Personal Freedom this year, whereas the US sits at 28th. Canada saw a sharp fall in Social Capital, dropping from sixth place in last year’s report to 11th this year. Fewer Canadians reported that they volunteered, voiced their opinion to a public official, and made donations to charity. The US increased its score overall, with more people reporting that they gave donations and received help. A recent report highlighted that, in 2017, Americans gave more than $400 billion to US charities, the largest sum ever. In Safety and Security, more Canadians reported consistently having available food and shelter, and in the US, there was a small fall in people feeling safe at night and the number of homicides increased slightly from 4.4 per 100,000 to 4.9. Within Economic Quality, Canada ranked 21st and didn’t register a decline in a single indicator. The US, whilst rising in score overall, saw a fall as a result of a small decline in its economic complexity score. North America remains far above any other region for Business Environment. Canada ranks 3rd in this pillar and the US is 1st. Despite improvements this year overall, both countries received lower scores in the Logistics Performance Index, a measure of the ease of transporting goods into and across a country. Education saw moderate improvements; more Americans and Canadians reported being satisfied with their children’s schools and believe their kids are actually learning. Both nations improved their Health scores this year, yet they still perform badly in illness and risk factors; 36% of the US population is obese, which is the second highest in the world after Kuwait, and up from 29% in 2007. Canada also has a high level of obesity, with 29% of its population obese, up from 23% in 2007. Canada saw an improvement in the Natural Environment pillar this year, with an increase in the amount of wastewater that is treated, from 70% to 82%. In contrast, this was the only pillar in which the US declined, triggered by an increase in air pollution. As has been noted, one of the major themes of this report is that Safety and Security is foundational for prosperity, which is about whether people are safe, housed and fed. This depends largely on people securing adequate income, so measures of poverty and satisfaction with income are important. While North America is the most prosperous region overall, it falls a long way behind Western Europe in Safety and Security, while on measures of living standards, it scores similarly. Although only two countries, North America is very diverse. It is therefore important to look at a sub-national level to understand the patterns of prosperity. The region comes second in the world for Safety and Security – Canada ranks 17th and the US comes in at 43rd. Ranked alongside Western Europe, under Safety and Security it would be second from last, ahead of only Greece. In the US however, this poor overall performance masks some significant regional disparities. The US falls behind on a number of indicators related to personal safety and living conditions. Its homicide rate is 4.9 per 100,000 people, which is 87th in the world. In Canada, the rate is 1.7, ranking it at 49th. There is significant variation across the United States – the homicide rate in northeastern states is 3.5, versus 6.4 in the southern states. In New Hampshire it is just 1.3, versus 11.8 in Louisiana. If they were countries, New Hampshire would rank 37th, whereas Louisiana would rank 128th in the Index, similar to countries such as Panama and Uganda. There is also a high rate of road deaths – 12.1 per 100,000 in the US (ranking it 62nd in the world), and 6.1 in Canada (ranking it 28th). The rate of road deaths is much higher in the south and midwest. The best performing states, Rhode Island and Massachusetts, would be in the top 20 countries in the Index for this indicator. The worst, Wyoming, would place 118th in the global rankings, similar to a number of Sub-Saharan Africa countries. In terms of security of property, 14% of people report property theft in the US (76th), and 10% in Canada (42nd). Again, there are wide disparities across individual regions within North America. Although this survey data is not available at a state level, the number of property crime incidents shows that the northeastern and midwestern states have significantly less crime than southern and western states. On average, in the northeast there are 1,600 incidents per 100,000 people, compared to around 2,700 in the south and western states. The patterns are similar for the measure of how safe people feel walking home alone at night, where the northeast and midwest outperform the south and west. When considering adequate food and shelter, North America performs more strongly. In Canada, 11% of people say they have struggled to provide enough food for their families (24th in the world), and in the US it is 19% (44th). In Canada, 7% say they have found it difficult to provide adequate shelter (22nd), compared to 13% in the US (38th). Within the US, the southern states perform poorest across these two indicators. However, there are higher rates of homelessness in northeastern and western states. In many cases, a person’s income has a significant effect on the security of that person and their family. Within the Economic Quality pillar, we measure people’s perceptions of their own living standards, as well as poverty rates. Both the US and Canada are relatively strong on perceptions of living standards and household income. 87% of people are satisfied with their standard of living in Canada (15th in the world), and 84% in the US (19th). On this measure, the lowest scoring state, Mississippi, would rank 53rd, showing that the spread across this indicator is not as wide as others at a sub-national level. Despite a low absolute poverty rate (the number of people living on less than $1.90), both the US and Canada have high relative poverty rates at 17.8% of the population (65th) and 14.2% (50th). Unsurprisingly, the states with the lowest poverty rates are in the northeast, and the states with the highest poverty rates are in the south and west; Mississippi, Louisiana and New Mexico are all in the bottom three. This analysis shows the value in understanding the sub-regional, and even sub-national, features of prosperity. Like other global regions, different parts of North America face different challenges to prosperity.